Been living around the area for more than a decade and I dropped in this pub for the very first time on Wednesday. On the corner of Sydney Road and O’Hea Street, you won’t miss the hotel with a bottle ‘o’ by its side; it is also walkable from Coburg Park Reserve after getting some fresh air and/or exercise – or the other way around. Somehow my friend and I decided to go get a kebab and ended up in the Drums Hotel. 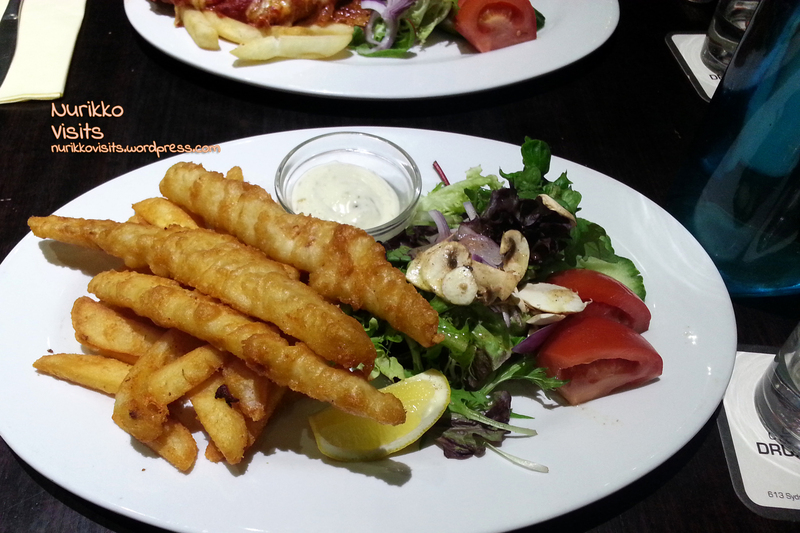 My friend and I ordered Chicken Parmigiana and Fish and Chips (around $33) from the extended menu – pretty standard pub food to order. It was a quiet Wednesday evening, we ordered our food and chose our table and rested. By that time I was already pretty hungry. And then I ran out of patience. I asked the man behind the bench for an update on our meals, he said to me apologetically ‘one more minute sorry’. 96 seconds later, our meals were delivered to our table. So, it took more than 30 minutes from ordering to serving. We weren’t informed by anyone of why it took so long, but luckily I had a great company. From all the waiting, my margins for the food lowered quite a lot. But you know what?! They were fantastic! The Presentation, Taste and Texture were all really really good. Fish and Chups >> Golden crispy yummy fish and chups. With grass of course. 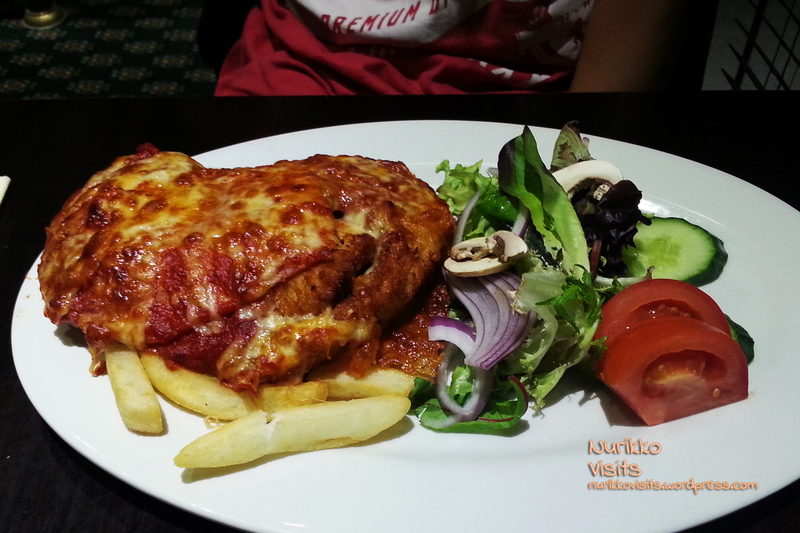 Chicken Parma >> The real pub with the real parma. A real big piece of chicken with good ol’ ham and cheese on top =Q__ need I say more? I guess, it was worth the wait after all. Categories: $ Cheap eats (below 15), $$ Moderately priced (15 - 30), Bar (Licenced), Coburg, Dinner, Hit, Lunch, Pub, Recommended, Wide Range Beverages | Permalink.